Everyone loves a deal, regardless of how much money they have, and consumers use the Internet and smartphones to find the best price, online or offline. Additionally, shoppers use a variety of coupon sites, like RetailMeNot, the online version of pennysavers, which run as affiliate programs, and attract deal seeking customers. As a result, purchasers have close to perfect market knowledge before they buy. Enter a variety of new options, group coupons that offer deals requiring a minimum number of customers to commit to the offer to activate the deal. The question for marketers and merchants is: do these deal make sense for your business? Chicago-based Groupon is the leader in this category with an audience that skews middle class according to Experian Hitwise. 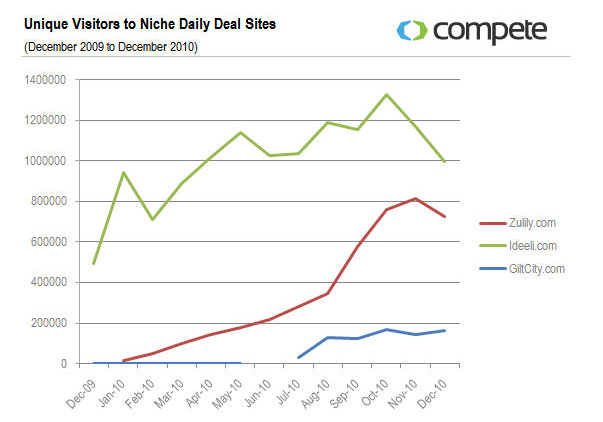 Compete reports that Groupon has grown from 2 million visitors in December, 2009, to 15.6million in December, 2010. Groupon gained visibility with its Gap offer of $50 worth of merchandise for $25 in the midst of the August back-to-school season, selling 440,000 units for $11 million in revenue. Groupon turned down Google’s $6 billion buy out offer. By contrast, Living Social, with an audience of early adopters was bought by Amazon for $175 million. 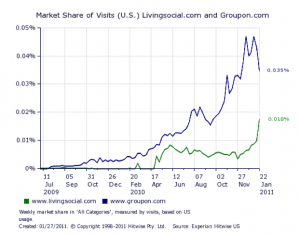 Based on Experian Hitwise’s analysis, Living Social, which had one tenth of Groupon’s traffic, has been closing the gap with Groupon. Recently, Living Social ran a $20 Amazon coupon that cost $10, selling 1,378,938 vouchers worth $13 million in revenue. 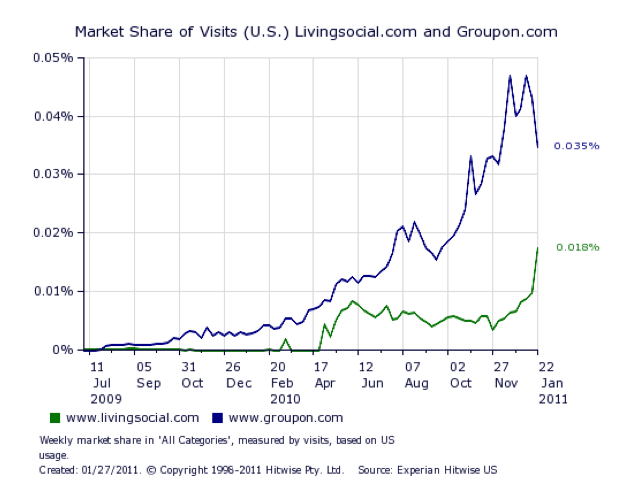 In part, this is attributable to LivingSocial’s amazing Amazon deal and a concurrent falloff in Groupon’s traffic. An analysis of the offers would determine whether there are other factors contributing to Groupon’s decline. Where are the national offers? What these sales, Gap and Amazon, have in common is that both were for major national retailers, not small, local firms. Further, these offers generated lots of media attention, creating extra traffic. But scratch below the surface and they appear to be the only big sales these firms had. One challenge is the fact that, since there’s no cost, consumers can and do register for multiple emailings. They chose what looks good to them. Therefore, it’s incumbent upon the retailer and the dealmakers to make their offers as enticing as possible, leading to very deep discounts. Add to these issues the fact that consumers cherry pick special services for one time use. Based on my friends’ experiences, they use them to treat themselves to services that they might not do at full price, often a girls’ day out. Not the type of traffic you can build a business on! But by far the major impediment is that research showed that Groupon was unprofitable for one third of the merchants surveyed and that over 40% of them wouldn’t run a repeat offer. For a small and medium size businesses those odds can be daunting. Another issue is that there’s a low to no barrier to entry for new players. Anyone with significant customer reach and database can compete in this market. Among the potential entrants are Facebook, Google which is rumored to be testing the market, location based services like Foursquare and Gowalla which can leverage their mobile reach, Yelp which has relationships with local business and old fashioned local newspapers and related media that already have local business relationships in place. If this market wasn’t crowded enough with potential entrants, there are niche players such as Ideali and others. As Compete points out, these firms could imitate Woot.com, the fun daily deal site, also owned by Amazon, that’s expanded their offering into new niches as a model. While sales numbers like the ones that the Amazon deal rang up for Living Social look appealing, it’s critical to run the numbers on a variation of potential response rates to determine if a deal like this is worth your investment. Never underestimate the ability of a parent company like Amazon to be able to benefit from the additional sales information and data integration across businesses. 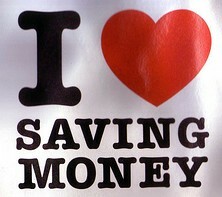 As 2011 progresses, we’ll see how businesses continue to compete and evolve in this coupon space. One thing’s for certain: there will be more and fiercer competition. Further to entice small business owners in, it’ll be necessary to ensure that they can do better than break even because if they don’t succeed the model won’t work. What do you think? Would you do a Groupon or similar deal for your business? Why or why not? Doing the Math on a Groupon Deal? via New York Times – shows how to do the step by step math. A must read for small businesses. Groupon is No YouTube via Harvard Business Review-contains great data on branding and pricing. Tags Amazon, Compete, groupon, Hitwise, Living Social, Retail me not. Bookmark the permalink. 11 Responses to Do Groupon Deals Make Sense for Merchants? This was the WORST business decision I have ever made. I am here to warn small business owners to NOT do this. I was overwhelmed by the amount of cheap and rude customers this deal brought in. I have been in business for many years and never encountered anything like this. They are coupon hoppers, 99 % do NOT return and no one can tell me it was because of bad service. I gave them the same great service that has kept me in business this long. Those who did return only did given another discount. Advice for anyone considering this. These companies promise all sorts of BS. Do your own deals and get half your normal price. Don’t settle for only a quarter and lose money while these vultures take your hard earned dollars. Give deals to your clients, their family, friends, co-workers, etc.. instead. This is especially bad for the service industry as these people do not tip well or at all, they are late and do not call. They will go online to complain about your business even though you are bending over backwards for them. Now you have to wait a YEAR to get the second half of the payment which is insane, what small business can afford to wait a year ? I think this hurts the economy, puts people out of business and these are not customers you want ! I agree I did the same and was taken advantage of by groupon. Groupon will make every excuse not to pay the merchant . Groupon is a scam and thr clients it attracts are opportunist who will take advantage of your business. As a small business owner you really need to work through your figures properly before committing to a deal. I’ve been doing deals with Groupon and other major coupon companies for almost a year and yes i do clean carpets. When i started i jumped in head first and it was difficult. I didnt expect repeat custom from most of the new customers even though we did an excellent job – as mentioned above these are people that wouldnt usually pay full price for this service and to make matters worse, as they dont usually get their carpets cleaned regularly, a large number of the jobs were very difficult and time consuming (which further reduces our daily income). So why am i still doing coupons? The answer is simple. I took the coupon model and made it work. I offer a deal which when purchased gives the voucher holder an additional discount on any extra work they want done at the same time. I also offer them other products and services too – at very attractive rates. In short i’ve turned a loss leader into a profit maker as all the add-on services are profit – i dont pay the coupon company any commission on the extra business i drum up. It’s all about upselling and if you dont do it then you could lose thousands. Dont ask the customer if they want anything else after you have serviced them…. ask before you service them. This month i’m lauching my own spot remover on a national level in the UK. I’m also incorporating it into a local deal for the city i clean carpets in – something i would not have done without the coupon deals. It’s been a hard slog getting here but i think i have finally got it right and we are now getting referral work and requests for a follow up in 12 months which is great. We’ve tried Adwords and other forms of advertising and if you want to put a lot of customers in front of you, coupons is the quickest and probably cheapest way to do it. But it’s then up to you not the coupon company as to whether you capitalise on an oportunity or just provide a service. I say jump on the customer, show them you can do a great job, offer them a service they will remember, educate them in a practical way that will improve their lives (we provide some great advise) and give them a good reason to knock on your door next year and tell all their friends about how great you are (we send thank you emails with discounts for their friends to use). Sure it’s hard work but hey there is a recession out there and its better than no work which is what a lot of cleaning companies have – especially with the amount of competition out there. Heidi do you know if Groupon has a built in mechanism for preventing consumers from purchasing multiple vouchers? And also, is the “cap” on number of vouchers sold set by the merchant or is that something that’s pre-set by Groupon? Also, how different is the experience for an online merchant selling a non-perishable product vs. a brick and mortar merchant selling a service or perishable product? Thanks for the article Heidi. Small business owners should be extremely cautious before committing to groupon or living social. I met with a living social representative today, the figures she was able to provide for my industry (past merchants who used living social) were quite alluring. However, when you break down a per job cost (even with 80% profit margin) the numbers don’t add up. The model she used was a living social deal of $59 per job for carpet cleaning. Living social sent the owner of that particular carpet cleaning company a $31,000 check for 1,000 jobs. That equates to a gross income of $31 per job, when you subtract insurance, fuel costs, and chemicals, its a little less than $25 per job net profit. I’m not sure how anyone in my industry can afford such a ripoff! This was very well authored and easy to understand. Unlike additional blogs I have read which are really not that good. I also found your posts very interesting. In fact after reading, I had to go show it to my friend and he enjoyed it as well! Groupon is terrible for business owners. After the deal (minimum of 50% off) and the cut that they take, you’re left with only 25% of the retail price of your merchandise. 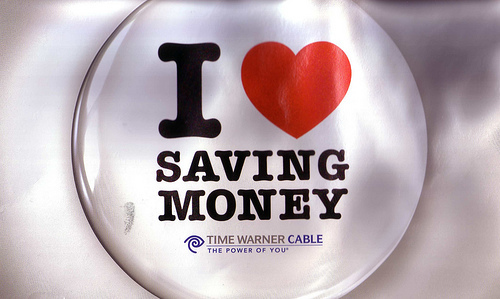 Subtract the cost of the merchandise, and you’re probably losing money. A Groupon can potentially introduce a customer to something they did not know about and in that respect have a long tail. As with any loss-leader offer this is really hard to track. Also as you point out sometimes folks just won’t go for something at full price and for some items just moving the inventory is what is needed as would be the case for a clearance sale. I think sometimes it is helpful to try and think of these new tools in terms that are already familiar. Hey you don’t have coupons for everything or run a clearance every day (unless you are in the carpet business) so it is something you can add to your mix of tools selectively. I do think Groupons are here to stay.